It’s been said that the Japanese are among the world’s best-educated people, as Japan boasts near zero illiteracy and dropout rates. The key to educational success begins at home in a child’s early years of development, regardless of where a child is born. Now children in America can enjoy the benefits of a Japanese education with learning at home or on the go with the WonderMind multi-sensory learning system. 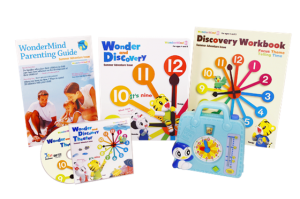 Japan’s number one child development product, WonderMind was created by Benesse Corporation, a global leader in correspondence education and publishing and parent company of educational giants Berlitz Language Schools and ELS Language Centers. Since debuting in Japan in 1988, WonderMind is used today by one out of every five kids in Japan, making it the country’s number one educational product for preschoolers. WonderMind was released in America in June by Benesse America Inc., the new American branch of Benesse Corporation that was established in February of this year. A complete five-piece interactive learning system designed with the help of experts in child development, WonderMind’s Summer Adventure series is available as two separate kits for toddlers ages one to two and children four to five years old. This special edition – carefully selected from the best of more than two decades of WonderMind’s most successful and effective products, and released in America following a year and a half of extensive research – is available only for the summer, and is ideal for getting children more school-ready every day. Known as “Kodomo (Children) Challenge” in Japan, WonderMind works according to the developmental stage and interests of the child within those first five years, engaging the senses and enriching the parent-child learning experience through age-appropriate books, educational toys and DVDs. Outside of Japan, WonderMind’s comprehensive subscription-based education system continues to provide nourishing content essential for a child’s growth and development in China, South Korea and Taiwan. In the Toddlers 1-2 kit, the main theme of colors and shapes are introduced through the educational materials along with WonderMind’s exclusive stickers and Colorshape Blocks, which can be made into dozens of things using your imagination. Also included in the 1-2 kit is a very special tiger puppet named Teegy. Known as Shimajiro in Japan, Teegy is the official mascot of WonderMind and is recognized by children and parents throughout the country. Using the character Teegy for interactive play and pretend activities, parents can make a strong relationship by getting involved with their children, as Teegy himself “grows up” with the child over the course of WonderMind, mirroring the child’s own development and becoming more like a true friend in the process. Since children learn best by seeing, touching, and doing, the WonderMind multi-sensory learning system separates itself from other learning programs by stimulating all five senses. Tick-Tock’s Talking Toy Clock, included in the Kids 4-5 Summer Adventure kit, is a perfect example of this, as this special educational toy provides audio encouragement to children for not only telling time, but also for using the custom interactive timer to better understand the abstract nature of time itself. In addition, Tick-Tock’s concepts are further illustrated in the DVD, workbook, picture book and parents guide included in the package, putting it all together so your preschooler can successfully grasp this lifelong concept well before school begins. Since its American release, WonderMind has received high praise from mommy bloggers attending special events hosted in New York City. You can see one such review from ToyQueen. If you have a young child and are interested in an educational tool that’s proven in Japan, give WonderMind a try. WonderMind’s Summer Adventure kits are available now for $29.99 each, with free shipping for the summer. For more information or to order by phone, call the WonderMind Information Center at 1-855-88-TEEGY (1-855-888-3349) or visit WonderMind’s website. Previous Previous post: Announcing the Winners of the Japan Society/JC•NYC JAPAN CUTS Yoshio Harada Trivia Contest!